It's become an international joke and a public health nightmare, yet one Montreal restaurant doesn't seem to care. Jukebox Burgers, who will be participating in this year's Le Burger Week festival from September 1 to September 7, is gearing up to sell their own $8 version of the strange doughnut-croissant-cheeseburger dubbed the cronut burger. 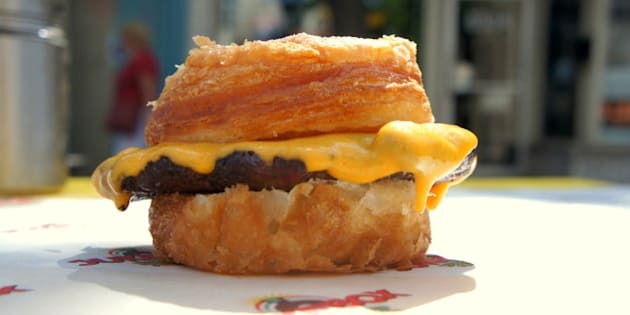 Earlier this week, nearly 150 people got sick from an outbreak of food poisoning linked to the cronut burger at the Toronto Canadian Nation Exhibition (CNE). While media reports have focused on the cronut burger served at the Epic Burgers and Waffles stand — which as since shut down — Toronto Public Health has still not pointed any fingers. But more than 500 kilometres away, it might be an awkward time to be promoting the cronut burger, an offshoot of the New York original, but Jukebox owner Derek Hirsch says he came up with the idea for the spinoff first. "We planned it before with La Cornetteria [home of the "cronetto" — another cronut copycat] and it was just the timing — we didn't make it because of the Toronto one," says Jukebox owner Derek Hirsch. Hirsch isn't worried about the cronut burger's bad rap. He already debuted the sweet-and-savoury burger at a pop-up barbecue over the weekend to positive reviews. "The problem isn't the combination. I don't want to point fingers, but it's care in preparation," he says. "If you leave meat out on the counter for too long, that's probably the reason." The scale of production will also be completely different. Hirsch plans to start off selling around 30 a day, while the CNE burger was aiming for 500 to 1,000. Meanwhile, he's not messing around with ingredients either. "Our meat is sourced from one cow and we take each piece of meat and grind it. We make sure everything is sanitary and I'm not worried — I know nobody is getting sick."